Okay, so these aren’t exactly tostadas – there’s no crispy fried tortilla. 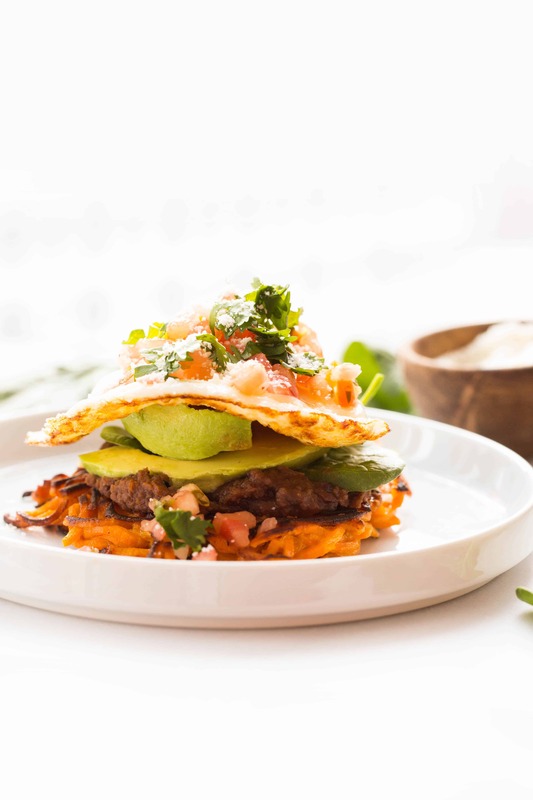 BUT, the toppings are the same as they would be with a breakfast tostada and instead of the tortilla, we’re using something heartier and more nutritious – spiralized sweet potatoes! I am a big fan of Mexican-flared food for breakfast. I love huevos rancheros, chilaquiles, and just pretty much anything with salsa, beans, eggs, and avocado. I could have that for breakfast, lunch, and dinner. The spiralized sweet potatoes here bring much more than the corn tortilla does to the table. Sweet potatoes are packed with antioxidants (like beta-carotene), fiber, Vitamin C, and potassium. They’re my favorite, especially because they’re slightly sweet, which amps up the flavor of any meal. 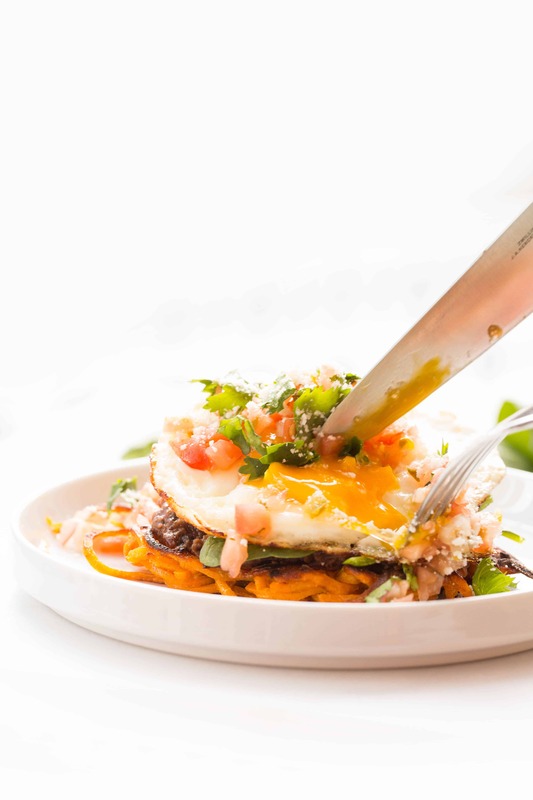 To make the sweet potato “tostada” all I did was mix cooked spiralized sweet potatoes with eggs and dropped the mixture into the skillet in mounds, flattening with a spatula as it cooked to create the most tostada-like shape. They’re kinda latke-like. The flavors of these tostadas are incredible (better than an actual tostada, I think!) and are easy to make – everything comes together very quickly, so don’t be intimidated. They’re perfect for entertaining friends for brunch, or just for yourself when you need an extra protein-packed way to start your day. *These points were calculated using the official Weight Watchers SmartPoints calculator. We are in no way affiliated with Weight Watchers, we are providing this information based on popular demand. Heat half of the oil in a large skillet over medium-high heat. Once oil is shimmering, add the sweet potato noodles and season with garlic powder, chili powder, salt, and pepper. Toss and saute until cooked through, about 7 minutes. Place cooked sweet potato noodles into a medium mixing bowl and let cool for 5 minutes in the refrigerator. Once cooled, add one egg and toss well to combine. Heat the remaining oil in the same large skillet. Once oil is shimmering, add about ¼ cup of the sweet potato mixture, repeating until skillet is full (about 3-4 portions.) Flatten each portion with the back of a spatula and let cook until bottom is set. Flip and let cook 3 minutes, flattening again with the back of spatula, until cooked through and crispy. Repeat with remaining raw mixture, if needed. Divide the sweet potato tostadas between four plates. Immediately coat the skillet with cooking spray and add in as many eggs as you can fit. Fry the eggs until egg whites are set. Meanwhile, spread each sweet potato tostada with refried beans, a handful of spinach, and avocado. Once eggs are done, top each tostada with a fried egg and top with salsa and cilantro. Sprinkle with cheese, if using. This looks amazing! but i think refried beans are missing from the ingredient list! i was confused for a few min looking at the pic and comparing it to the list, lol! Whoops! This has been fixed! Hi Ali- How many eggs do you put in the sweet potato mixture? Add one egg to the sweet potato mixture! Does one egg get mixed with the sweet potato? Yes! Add one egg to the sweet potato mixture! Yes! Save 4 for frying. Just add one egg to the mixture! Do the four eggs listed in the ingredient list go in with the sweet potato and then you use an additional four eggs to top each tostada? Just add one of the eggs to the mixture! The recipe looks yummy. Will have to look to see if there is are low/no sodium refried beans on the store shelves. Or, learn how to make it myself. Thanks for sharing! You can also just mash black beans! 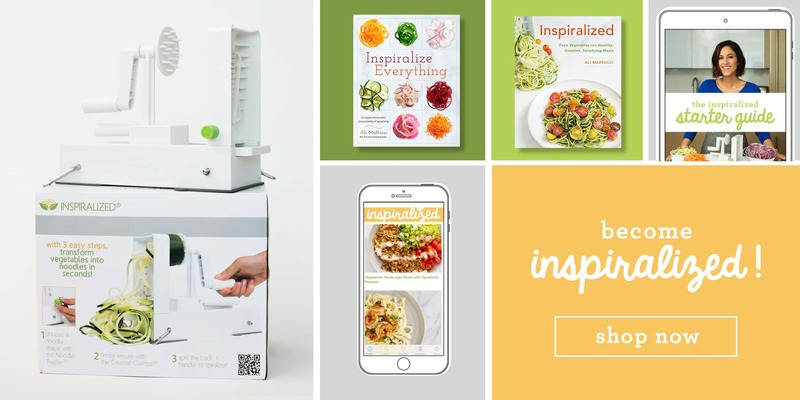 Hi Ali, I love your recipes and Inspiralizer. I am a little confused by this recipe. I can usually figure out most recipes but I'm not sure, how much oil do you cook the sweet potatoes in first? Later you mention remaining oil. Also, how much egg do you mix in with the sweet potatoes, as someone else already asked. I can imagine how much thought must go into all your recipes and if you're like me, I know what I'm saying in my head but when I write things down sometimes I forget to explain something fully. Jean, the recipe is updated, so there should be no issues! Thanks Ali for the update. That would have been my guess to use half the oil first and half later. You're awesome! Have a super day. oops sorry Ali, by the time I sent my post you already answered the question about the egg! Thanks. SO pumped to try these! 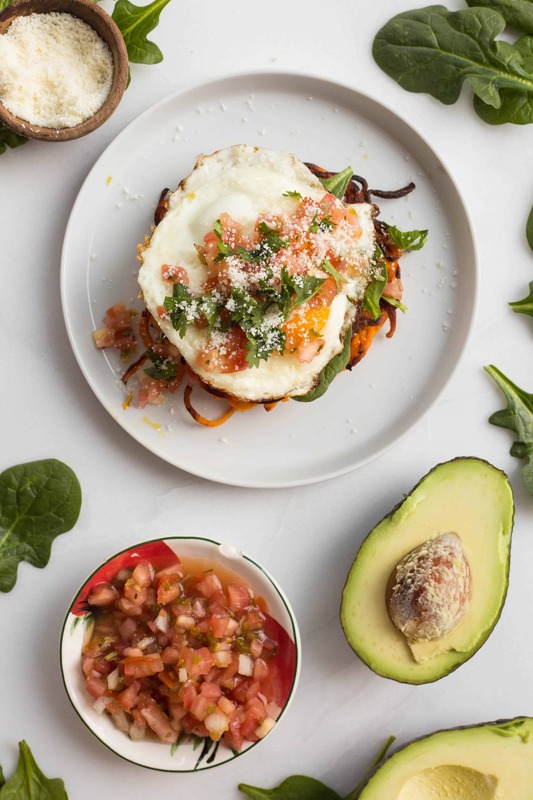 We're big fans of breakfast foods for dinner (probably because we aren't home long enough in the morning to cook a real breakfast) and adding a Mexican flare just seals the deal that these need to be on our menu next week. I know, they look so good, don't they. I could eat that for any meal ! Thank you so much, so happy you're excited to make them! Could you make the sweet potato "tortillas" and freeze them for later use? You could but they would be a bit floppy! Sorry for being a little dim - it calls for 4 eggs. I just want to confirm that all four are to be mixed with the sweet potato noodles? And then any fried eggs are additional? Thank you -this sounds amazing! Sorry, I see that since I posted, my question has been answered. :) Thanks! Hi Ali, Just wondering if you could make the potatoes ahead & reheat or is it better to make them & use right away? Thanks. Made this for dinner tonight - delicious. I sauteed some canned chicken breast with salsa to replace the beans and topped the fried egg and everything else with salsa verde. Dear Ali, Would you please consider creating a "cookbook" of RAW recipes? That would be super awesome! Thanks!